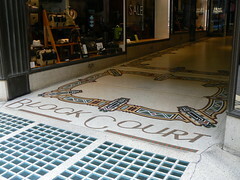 This is the entrance to the Block Court, off Collins Street, in Melbourne. 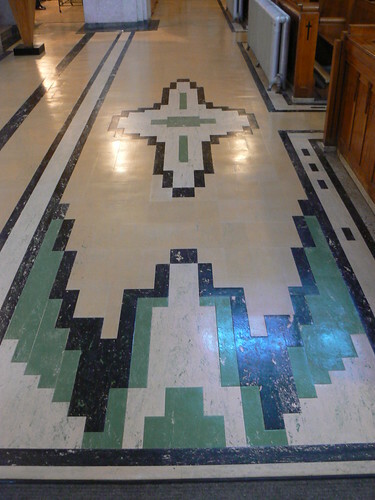 In the photo on the right you can see terrazzo floor of the arcade with the Block Court name incorporated into the the flooring. 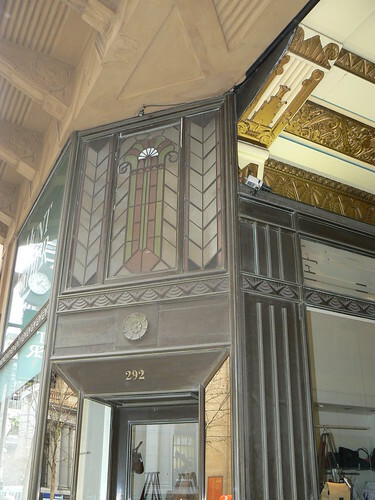 Notice also the windows of the shops in the arcade and the vent below each window. The photo above shows the lettering above the entrance to the arcade and the ornate ceiling beyond. 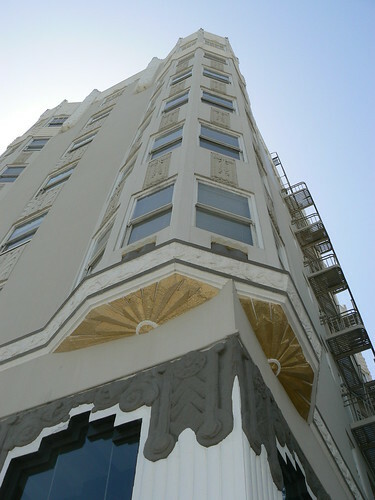 You can also catch a glimpse of the style of the building above street level. Originally it was build at the Athenaeum Club in 1890, then in 1930 it was remodelled from designs by Harry Norris. 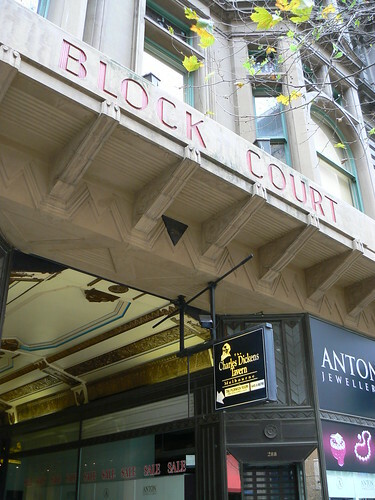 The building was renamed Block Court and the shopping arcade was added at street level. 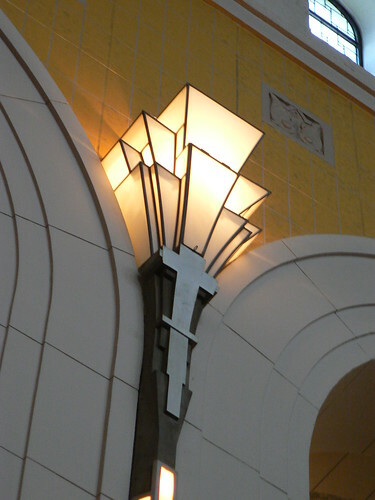 The arcade oozes Art Deco elements. The copper frames of the shop windows bear a zig-zag pattern. 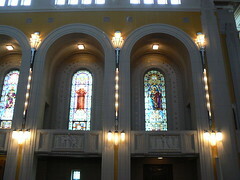 The stained glass above the doorways have side panels with chevrons and an elaborate deco centrepiece. 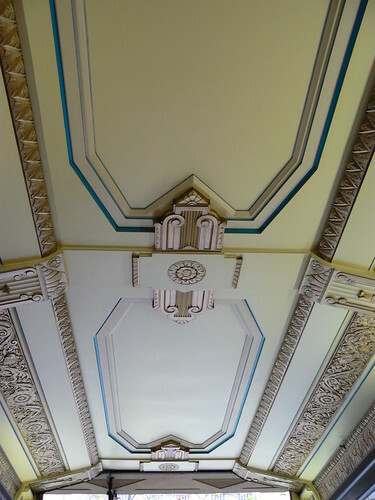 The ceiling decoration includes stepped geometric shapes and stylished floral motifs. 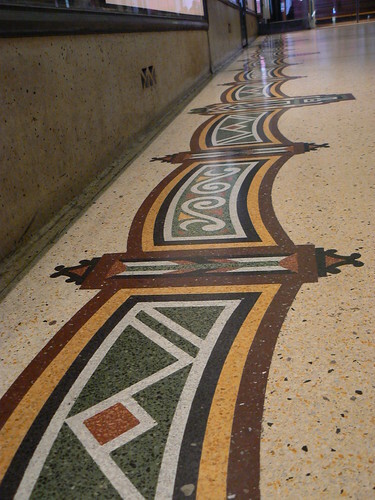 Then, finally, there is the floor with its mulit-colured terrazzo border. 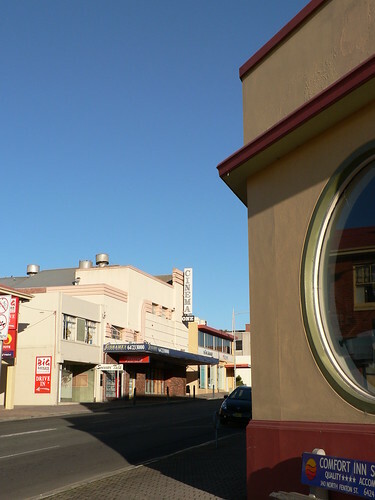 I seem to have captured the Cinema One in Stewart St, Devonport, Tasmania in its death throes in April 2006. The Cinema One signage is still there but the glass in the doors has been papered over and there is no sign of any film promotions or marquee. There is not much else I can tell you about this cinema. 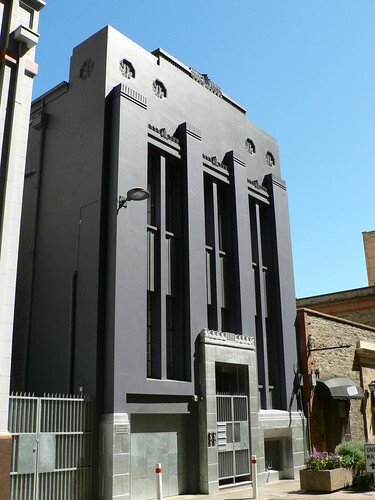 It doesn't seem to be listed on cinematreasures.org and while it is listed in the Tasmanian section of Cinema History Around the World, all its says is that the capacity was 288 and it is closed. 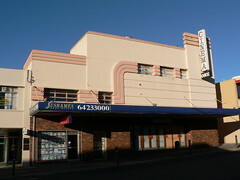 Thomas Ryan wrote about this building on his Art Deco & Modernism Architecture Tasmania blog posting a photo from 2008 with the former cinema sporting a new paint job and operating as a furniture and giftware store. Surely someone from the Apple Isle can fill me in on the history of this significant Devonport building! 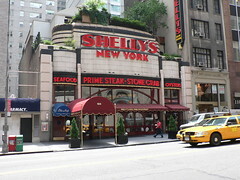 I snapped Shelly's Restaurant at 104 W57th Street in June 2005 with no inkling that before the end of the following year it would be demolished to make way for a residential tower. The building was originally constructed as a Horn & Hardart Automat in 1938 and an on-line petition directed to the NY Landmarks Preservation Commission and Manhatten Councilmembers failed to save the Automat. The Astor Theatre in the Perth suburb of Mt Lawley started life in 1919 as The Lyceum. At the time, architect, builder and owner, Simon Bremner, claimed it was the coolest building in Western Australia due to the ventilation installed in the theatre. 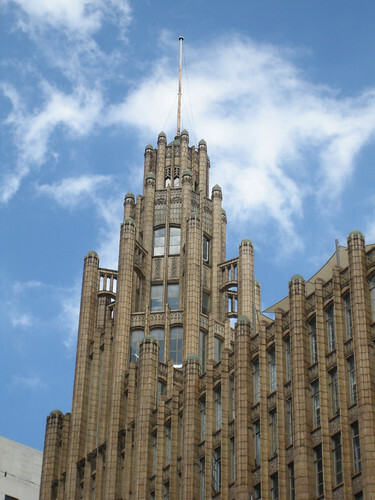 The current operators claim it is still one of the coolest buildings in WA in a less physical meaning of the word. By 1930, the venus had become the State Theatre and State Summer Gardens with extensive renovations coking later in the 1930s. The gardens survived until 1970 but the State lost it's name in 1941 due to a State Givernment decree that private enterprises couldn't use that name. The Astor was born. 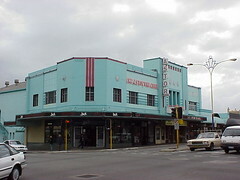 Over time the building has been split in two showing Adult films and Italian language films, hosted bingo and karate lessons before being Heritage Listed in 1988 when threatened with demolition. 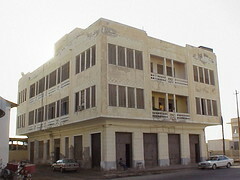 The theatre was refurnbished in 1991 and currently is used for both films and live concerts. 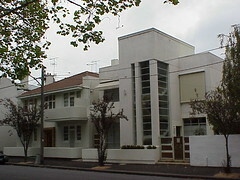 These flats at 67 Bromby St, South Yarra, were built in 1937. The Sands and McDougall directory of 1938 lists them under the name Yarrum Flats but the building doesn't appear to have a name anymore. The flats are dominated by the glassed stairwell and I really like that the profile of the stairs is visble through the windows. 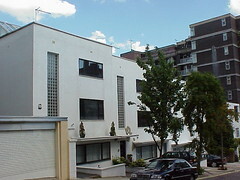 They are a striking block of flats in an inner suburban street. 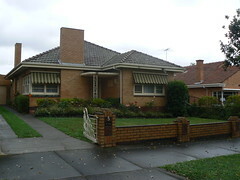 The houses in Peterleigh Grove, Essendon were mostly built between 1939 and 1943. I don't think there is much to distinguish the house from many Australian suburban houses but the low brick wall and metal gates are a fantastic. 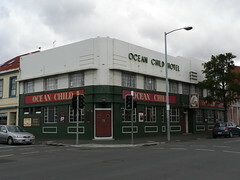 Earlier this month, Thomas Ryan posted a glorious b+w photo of Hobart's Ocean Child Hotel on his Art Deco & Modernism Architecture Tasmania blog. Unlike my photo (right), Thomas has concentrated on the signage remarking on how the lettering played a major part of Modernist design. It also looks like the hotel has been repainted (assuming Thomas has posted a recent photo) allowing the three-dimensional nature of the signage to provide the contrast with the body of the building. Too often we see the signage and other decorative features highlighted in contrasting colours where originally the design was intended to be more subtle. The shadows cast by the changing angle of the sunlight striking the facade at different times of the day providing the visual highlghting of the decoration. 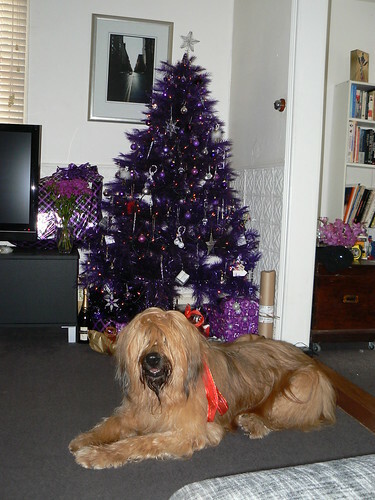 Go back and have a look at Thomas' photo again and I think you'll see what I mean. 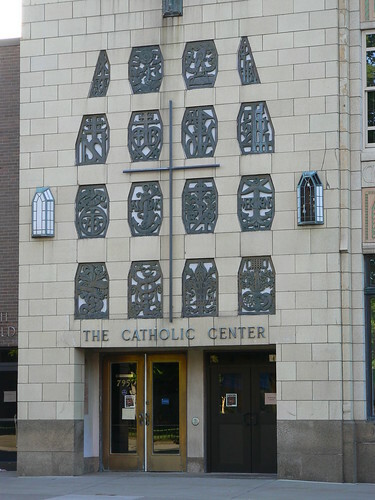 Clearly, from the name above the door, this is the Catholic Center. 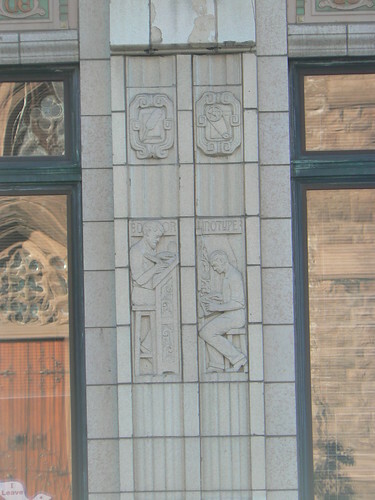 It is at 785-795 Main Street, Buffalo but the decoration indicates a previous life. 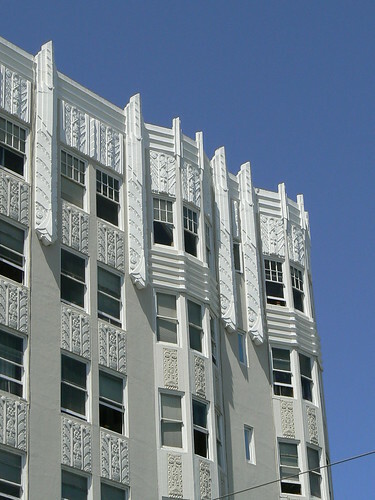 The building was constructed in 1930 from designs by architects Monk & Johnson, with H D A Ganteaume. 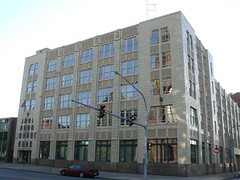 It was the home of the Courier-Express newspaper. I think the decoration above the door could be religious they are original to the building and some are cast bronze logos of various printers. Above each band of windows there are terracotta panels which designs that I have seen described as Celtic. I suppose it is wrong to describe them as 'fishbone' in style. 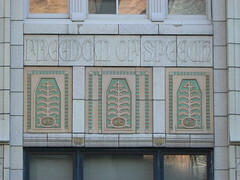 Above the first floor windows there is a series of friezes invoking the words of the First Amendment of the United States Constitution. 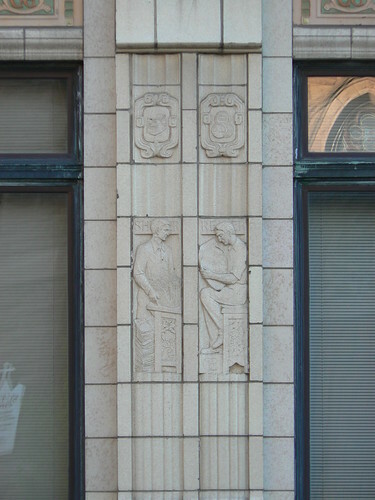 On the spandrels between the ground floor windows there are figures representing different stages of the life-cycle of production, distribution and comsumption of newspapers. These figures include editor and linotyper (above), compositor, printmaker, pressman, and finally, shipper and reader (below). 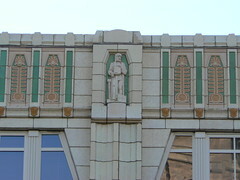 The decoration is no less spectacular at the roofline of the building. Standing in their niches set in a band of 'celtic fishbones' are the representation of four historical figures from the world of printing. Here we see William Caxton who introduced the printing press to 15th Century England. 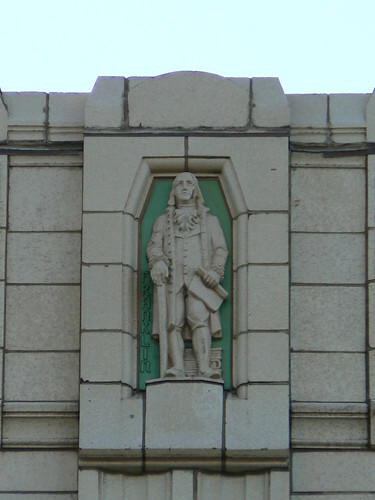 The other figures are Johannes Gutenberg, the first European to use movable type printing and inventor of the printing press; Christophe Plantin who worked as a printer and publisher in 16th Century Holland; and Benjamin Franklin, a printer, newspaper editor and one of the Founding Fathers of the United States. 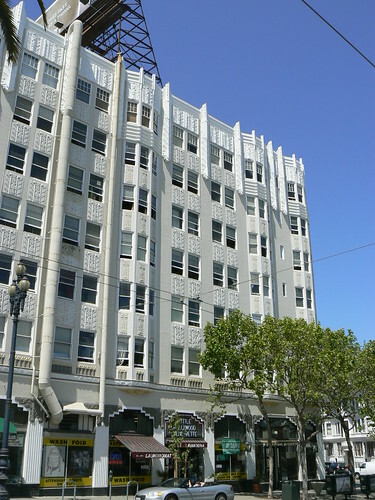 This building is on the corner of Market and Hermann Sts, San francisco. It appears to be residential on the upper floors and commercial at street level. 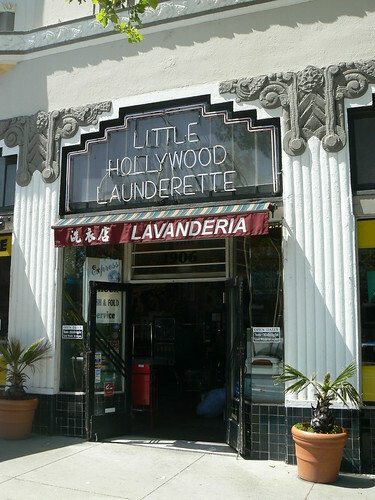 From memory, the triangle corner is occupied by a bar but, as you'll see in a moment, the Market St frontage is occupied by the Little Hollywood Launderette. 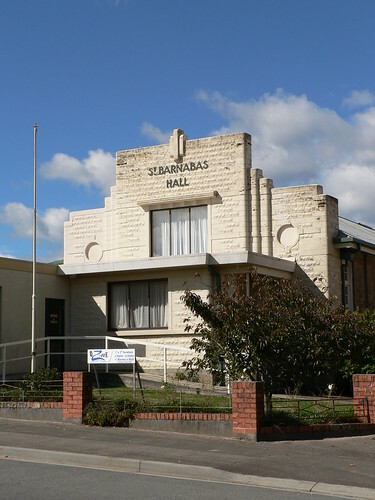 St Barnabas Hall in Scottsdale, Tasmania was built in Art Deco style possibly to replace an earlier Parish Hall for St Barnabas Anglican Church. I find it interesting that they used rough finished bricks for most of the facade then finished the decorative elements with smooth bricks. I wonder if the portholes on either side of the parapret were ever windows? 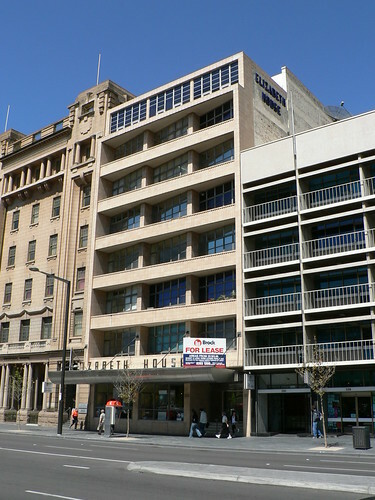 These apartments are the latest use of these buildins at 31 & 33 Gilbert Place, Adelaide. There were already buildings here when The Royal Exchange Assurance Company set up their chambers here in 1924. Then in 1936 the architectural firm of Philip Claridge were commissioned to refurbish the premises with the most visible change being the facade that we still see today. I especially like the decoration above the entrance which painted silver works well against the dark colouring of the rest of the building. 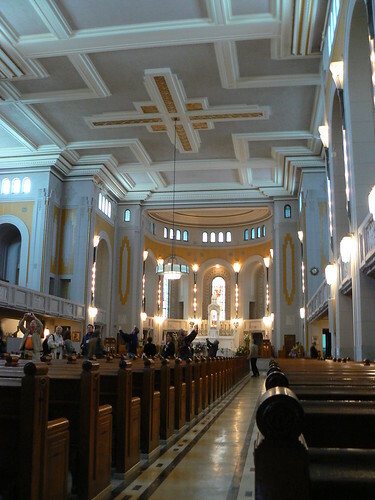 Yesterday on my post about the Église St-Esprit, I promised to show you the interior of this gorgeous church. The interior was designed by Toussait-Xénophon Renaud and some of the elements such as the flooring and the wall lights could be just as appropriate in a cinema. On the other hand the pews, seating on the main alter, the confessional boxes and the stained glass windows by Guido Nincheri do not belong anywhere but a church. 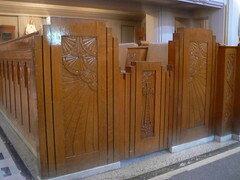 The pews at the front of the church are enclosed by these decorated Art Deco wooden panels. Each of the panels and the door are stepped at the top. I can see floral or sunburst forms in the decoration and, of course, a cross on the door providing access to the seating. 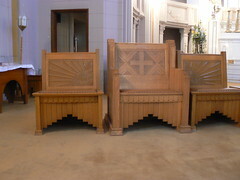 You can also see that elements of the seating are also decorated with similar Art Deco patterns. Similar patterns have been used in the backs of these chairs and I think it looks more like a sunburst here. Again we have a a representation of a cross on the large central chair which seems to employee more stepped forms than a chair can bear. Besides the stepped wooden slats below the seat, the armrest and the back supports are also stepped. 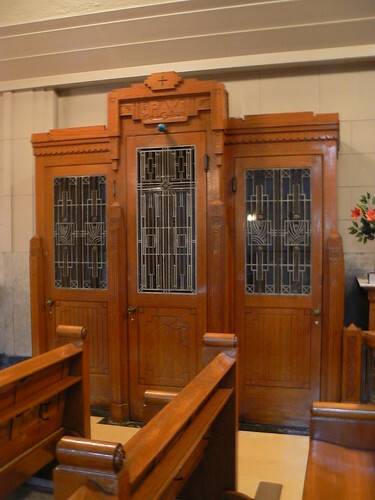 The confessionals are also decorated but not as richly as the other woodwork. The leadlight windows do make up for it though. 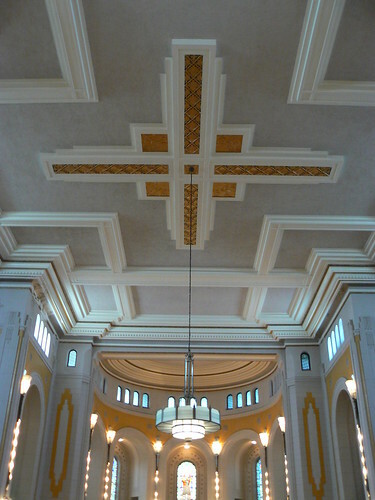 The ceiling is dominated by this cross. 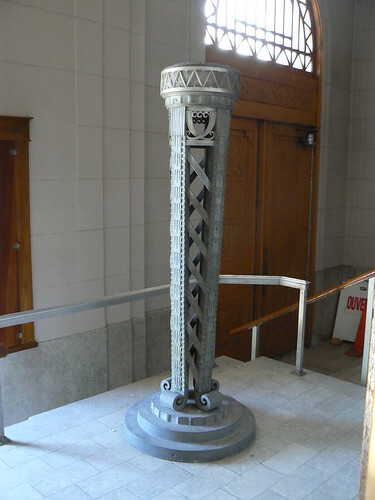 Again the stepped elements can be seen in this piece of decoration. Suspended from the cross is a large round light fitting. Definitely could be found in a cinema or theatre foyer. And if it wasn't for the cross below this wall light it could be in a cinema auditorium. The flooring is no less spectacular. I suppose it is terazzo but I don't know. It could be part of a theatre foyer. If you missed them on the way in, you can't miss the pair of lights on the way out. Perhaps about 2m tall standing each side of the door in the entrance foyer. 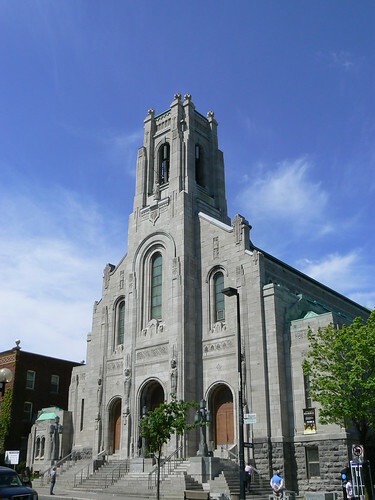 This is the Église St-Esprit in Rosemont, Montreal. 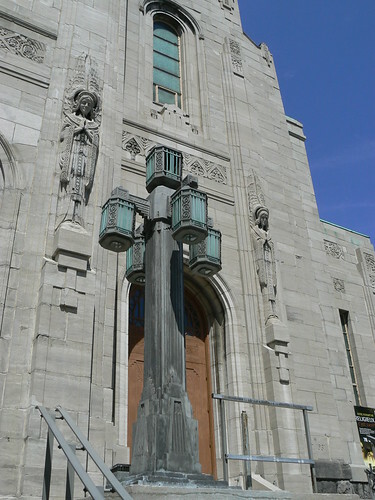 It was designed by architect Joseph-Églide-Césaire Daoust, constructed in 1932 and according to the Rosemont Tour Booklet from the Tenth World Congress on Art Deco in Montreal in 2009, it is the only pure Art Deco church in Canada. I especially liked the stacking of geometric shapes on this part of the church buildings. 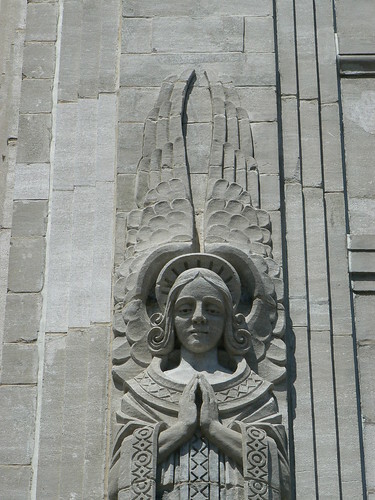 There are these angels on either side of the main doors. Finally there are three of these incredible lights in front of the church. 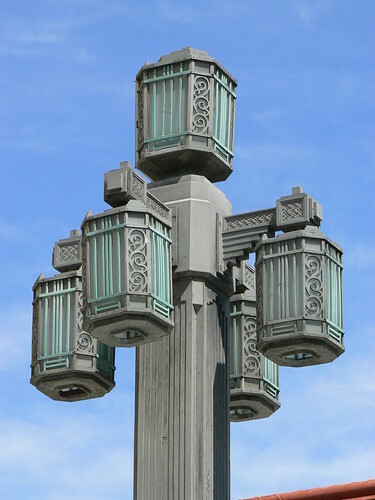 Originally there were four of these bronze torchieres but one was stolen in 2003 and melted down after it had fallen over. 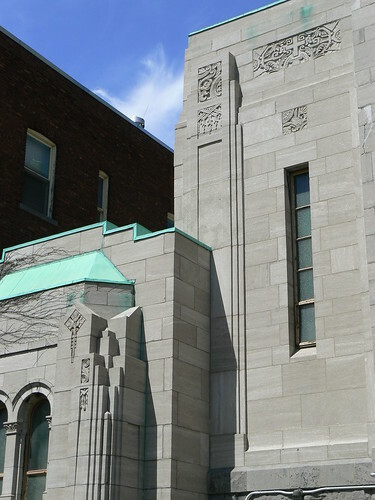 I haven't seen many churches in Canada I can well beleive that this is the most Art Deco of them. But wait there's more. Tomorrow, I'll post some pictures of the interior. Well, I am straying into dangerous territory today with this building. I don't know a lot about Elizabeth House in Adelaide but I suspect it dates from the 1950s and is more Modernist than Art Deco but then I have always maintained that I subscribe to the broadest possible definition of Art Deco that lets me include all manner of 20th Century buildings in this blog that more scholarly types would exclude. I just love the windows. Beresford Avenue is in an area of East Twickenham that in the 18th Century was part of the Twickenham Park Estate. 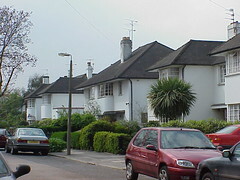 The sub-division of the the park from around the middle of the 19th Century saw a series of housing developments until finally Beresford Avenue was constructed in 1935. 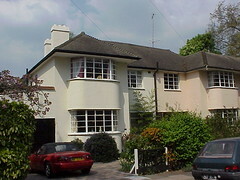 The Beresford Avenue Conservation Area Study published by the London Borough of Richmond Upon Thames in July 2000, states that the avenue was designated as a Conservation Area in 1990 because it 'is a cul-de-sac development of twenty six semi-detached two storey houses with garages built in the mid 1930s to a largely unified design'. The houses have these wonderful bulging window bays from the ground to the pitched roof with curved metal windows. 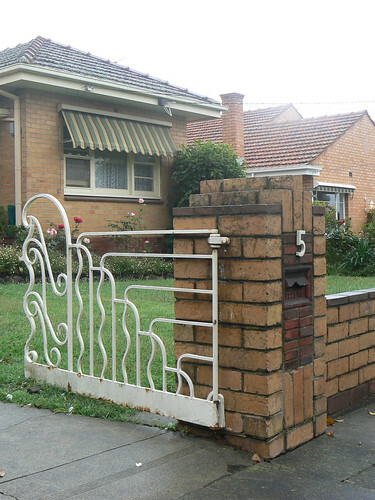 In general low walls or fences have been maintained and in some cases the houses still have the original sunburst design gates. 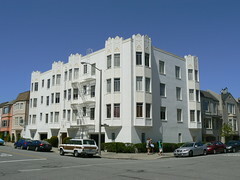 Marina is a San Francisco suburb briming with Art Deco apartments and 1600 Beach is a typical example. 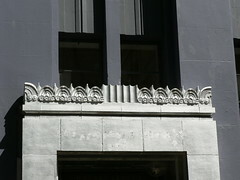 Decoration is typically limited to the roofline above the window bays and around the main entrance. Sometimes there is decoaration below each window but not in this case. 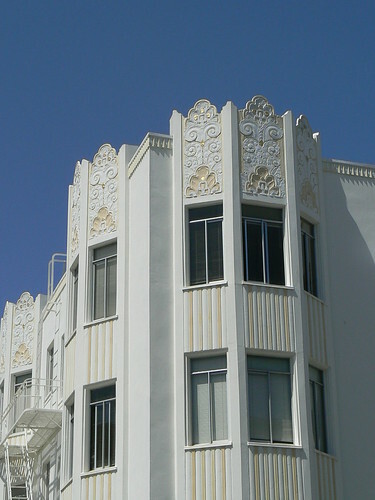 The decoration at the roofline of 1600 Beach is a great example of an Art Deco 'frozen fountain' which always reminds me of stylished tree ferns. 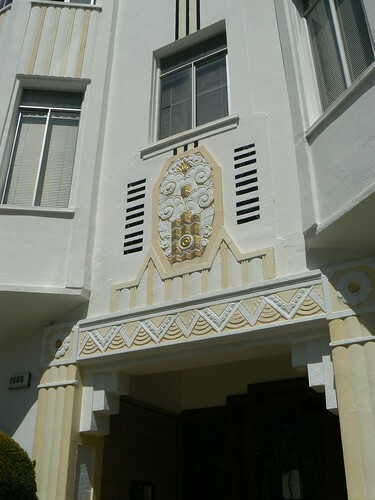 The same pattern has been placed above the entrance as the centrepiece of the decoration at ground level which includes a panel of chevrons, stylised flowers and stepped supports. The doors is set back in a tiled entrance. 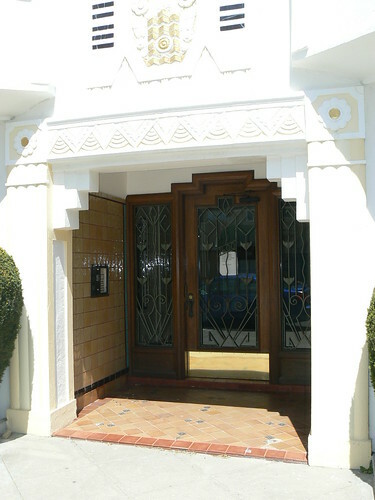 Deco patterns have been included in the metalwork of the doorway which also has 1600, the number of the flats, in the centre of the main door.